Suicide is one of the most difficult tragedies a family and community must face. The number of suicide and suicide attempts in Virginia each year is on par with the national average, but the Commonwealth is working to reduce those numbers. Suicide and suicide attempts cause enormous tolls in terms of loss of life, physical impairment and medical costs, grief and suffering, and disruption of families and communities. Medical costs resulting from hospitalizations in Virginia due to self-inflicted injuries total over $40 million per year. Research suggests that social stigma leads to inaccurate reporting; thus, these figures may not indicate the full extent of suicide attempts and completions. Between 1999 and 2004, an average of 794 Virginia residents died by suicide each year. Suicide was the 11th leading cause of death among Virginians and the third leading cause among youth. 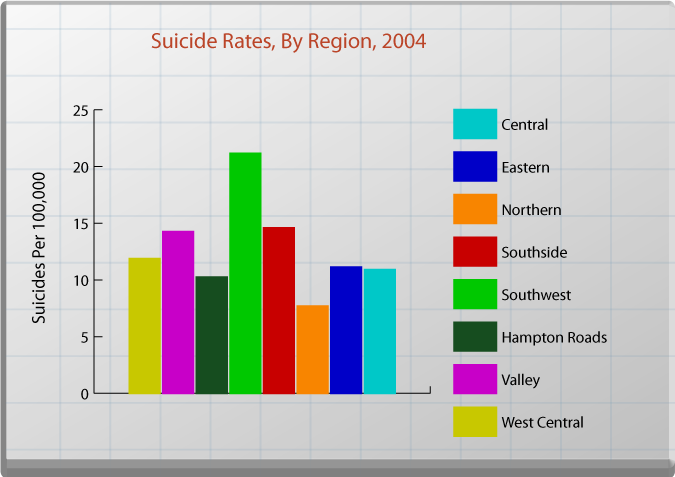 In 2004, the Southwest Region had the highest suicide rate at 21.15 per 100,000, while the Northern Region had the lowest rate at 7.67. 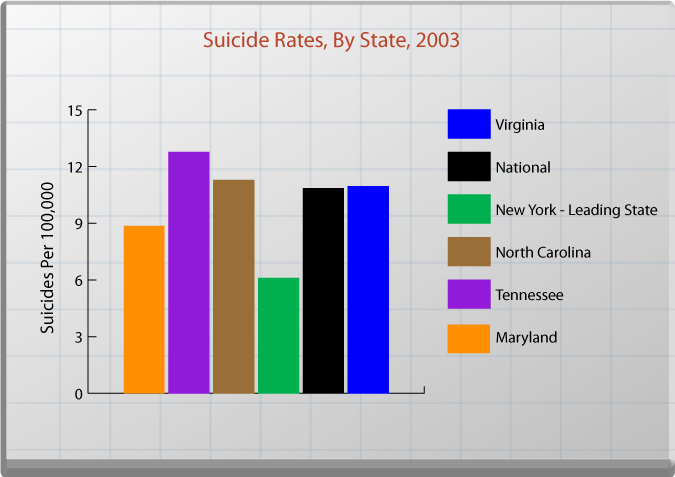 Relative to other states, Virginia had the 19th lowest suicide rate at 10.94 suicide deaths per 100,000 population. However, since some larger states, such as New York and California, had lower rates than Virginia, Virginia's rate was higher than the national average rate of 10.83. North Carolina, Tennessee and Maryland rates were 11.27, 12.75 and 8.85 per 100,000, respectively, in 2003. What Influences the Suicide Rate? Two groups particularly at risk are youth and elderly. According to the Centers for Disease Control, adolescents and young adults often experience stress, confusion and depression from situations occurring in their families, schools and communities. Such feelings can overwhelm young people and lead them to consider suicide as a "solution." Among the elderly, most suicide victims are seen by their primary care provider a few weeks prior to their suicide attempt and diagnosed with their first episode of mild to moderate depression (DHHS 1999). Older adults who are suicidal are also more likely to be suffering from physical illnesses and be divorced or widowed (DHHS 1999; Carney et al. 1994; Dorpat et al. 1968). The Department of Health and the Department of Mental Health, Mental Retardation and Substance Abuse Services is implementing measures to prevent suicide, including post-delivery checkups and access to mental health services for children and adults. Carney SS, Rich CL, Burke PA, Fowler RC. Suicide over 60: the San diego study. Journal of American Geriatric Society 1994:42:174-80. Dorpat TL, Anderson WF, Ripley HS. The relationship of physical illness to suicide. In: Resnik HP, editor. Suicide behaviors: diagnosis and management. Boston (MA): Little, Brown , and Co.: 1968:209-19. In October 2005, the Division for Injury and Violence Prevention at the Virginia Department of Health received a three year grant from the Substance Abuse and Mental Health Services Administration (SAMHSA) for State/Tribal Youth Suicide Prevention. VDH's Suicide Prevention Program involves providing leadership, resources and training to enable communities to make suicide prevention awareness activities and training widely available. Under the new grant, suicide prevention activities will be conducted in four pilot sites around the state while the training and public awareness activities begun under the previous cooperative agreement from the CDC for youth suicide prevention will continue utilizing funds from the state appropriation. Through Virginia's 40 Community Service Boards, a safety net of services is available to respond to potential suicides and emergency situations. The Virginia Department of Health's Suicide Prevention Program involves providing leadership, resources and training to enable communities to make suicide prevention awareness activities and trainings widely available.